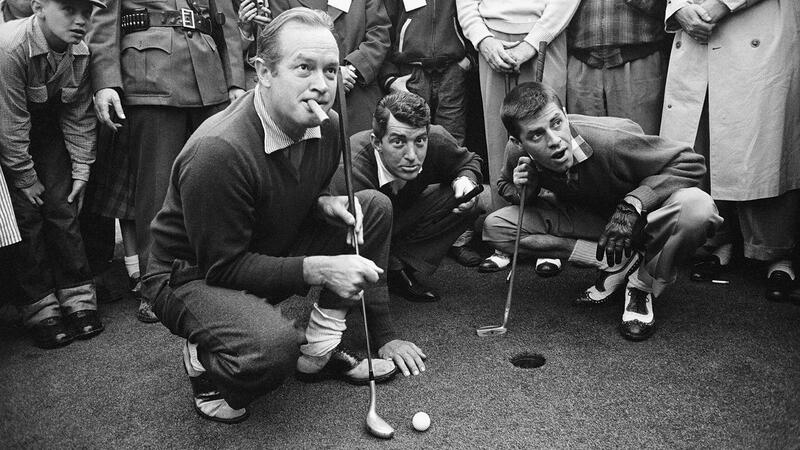 <b>Bob Hope, Dean Martin and Jerry Lewis</b> Three of the funniest comics of their day yuck it up at Cog Hill Country Club in Chicago on National Golf Day in 1953. Hope. Ruth. Sinatra. Gleason. Martin. Crosby. Some of the biggest names in celebrity history. Each is famous in their own right, and each took to the golf course for charity and relaxation. But when they teed up the ball, they didn't do so wearing a pair of khaki chinos and a polo shirt—they dressed camera ready. Celebrity golfers of yore swung persimmon woods and hickory shafted irons, and they did so while wearing fashionable clothes. Plus-four pants, button—down shirts, elegant sweaters—even the occasional French cuff-all was fair game when stepping out to play a little golf. We dug through the archives to showcase a selection of our favorite movie stars, singers, athletes and politicians on the golf course dressed to the nines.